Christoph Ulrich Mayer became the number 1 in Europe as Mental Business Designer® and has earned a great reputation as a speaker, coach and top speaker. As a management strategist, he advises countless clients, market leaders and hidden champions (and those who want to become one) worldwide, and provides mental business strategies that help entrepreneurs and private individuals to improve themselves and their results. In his lectures and seminars, he reveals the key mental strategies for success that any other businessman would probably never reveal. 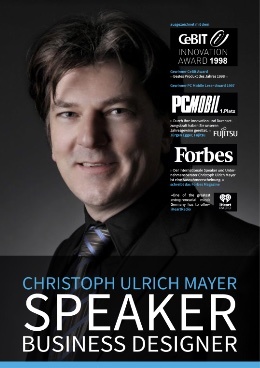 Christoph Ulrich Mayer touches, wakes up and inspires with his lectures, seminars and workshops. Try it out!